A man shot and killed his 22-year-old son after an argument over who would walk a dog escalated into a shootout Sunday morning on Chicago's Far South Side, police said. A man shot and killed his 22-year-old son after an argument over who would walk the dog escalated into a shootout Sunday morning on Chicago's Far South Side, police said. Officers responded to a call of a person shot at a home in the 9100 block of S. Woodlawn Ave. at about 8:20 a.m. in the city's Burnside neighborhood. There they found two men, ages 43 and 22, who had shot each other after a "verbal altercation," authorities said. 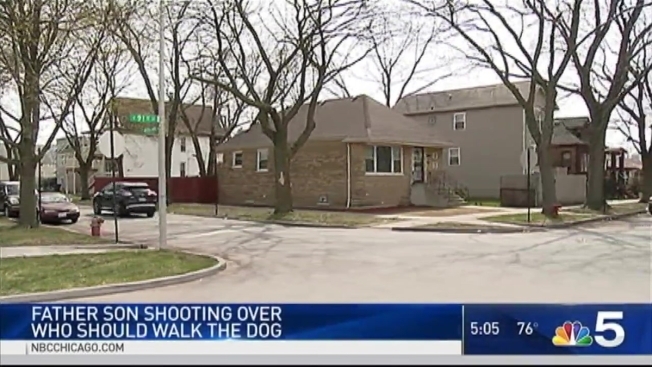 Chicago Police spokesman Anthony Guglielmi tweeted that the fight between the father and son was over "who was going to walk the dog" and that both men shot at each other. Both men sustained multiple gunshot wounds and were taken to Advocate Christ Medical Center, where the 22-year-old man was pronounced dead. The older man was listed in critical condition, authorities said. Police have not released the names of the men. Two weapons were recovered from the scene, according to police, who continue to investigate.